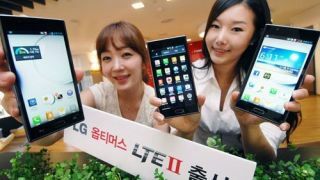 Korean electronics giant LG has announced a key milestone, with the company claiming that it has now sold 5 million LTE smartphones. Although LTE is not yet available in some territories, including Britain, this has not prevented LG from reaching a key figure – with the Optimus LTE making up two million of its five million total sales. LG also revealed that the Optimus Vu has hit the half million mark and has been speedily joined by the new kid on the block the Optimus LTE II, which was released in May. "Sales of global LTE smartphones are expected to increase ten-fold this year from last year," said Dr Jong-seok Park, President and CEO of LG Mobile Communications Company. "With that in mind, we are planning to introduce an even more impressive LTE line-up in the next several months second to none." LTE is fast becoming a major factor in the phone world, with the next generation of mobile connectivity meaning faster data transfer rates. LG, a company that has struggled for purchase in the mobile markets of late, has been at pains to point out that it has a number of advantages in the LTE realm with patents it believes are worth $9 million (£5.7m).